Boston. It may be called Beantown, but it also has one of the most vibrant Italian neighborhoods in the country. Known as the North End, this immigrant hideaway located in the north east section of downtown, brings diners from near and far to sample some of the best Italian food that you’ll find anywhere. Take a stroll down Hanover Street, the main thoroughfare, and you’ll pass elderly Italian gentlemen leaning back in their chairs on the sidewalk playing cards, chatting about who knows what, and sipping their stout espressos. Nonni are seen in their modest dresses and flat black shoes carrying grocery bags and wheeling carts filled with their shopping bags to their apartments located above the businesses. The smells of gravy, meats, and pasta fill the air. Trucks are stopped in the street while delivering packages to the stores and people dart across the street, ignoring traffic, to find the best that each shop or restaurant has to offer. 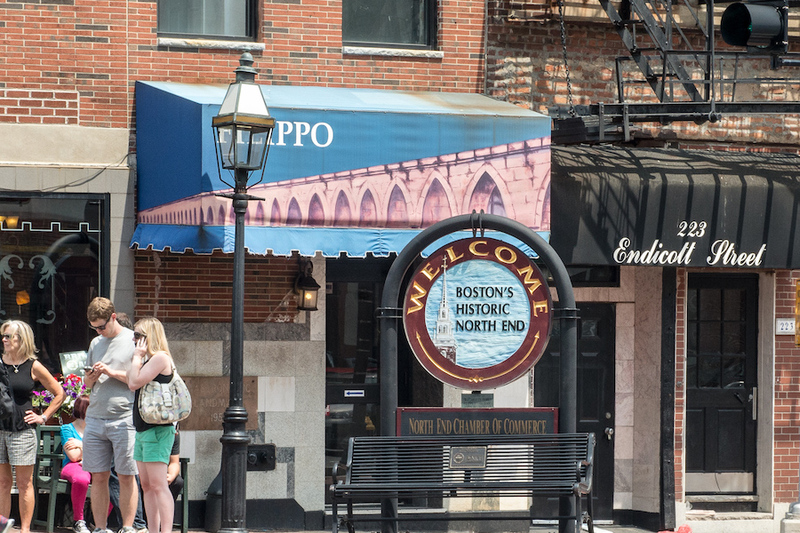 During the day, most visitors to the North End are here to experience sensory overload and to have a rich and creamy espresso and eat cannoli. And while many restaurants serve cannoli, there are two shops that will cause an argument in the street over whose cannoli is best. Modern vs. Mike’s. The cannoli wars. I moved to Boston from the Midwest many years ago. Boston was a culinary playground. 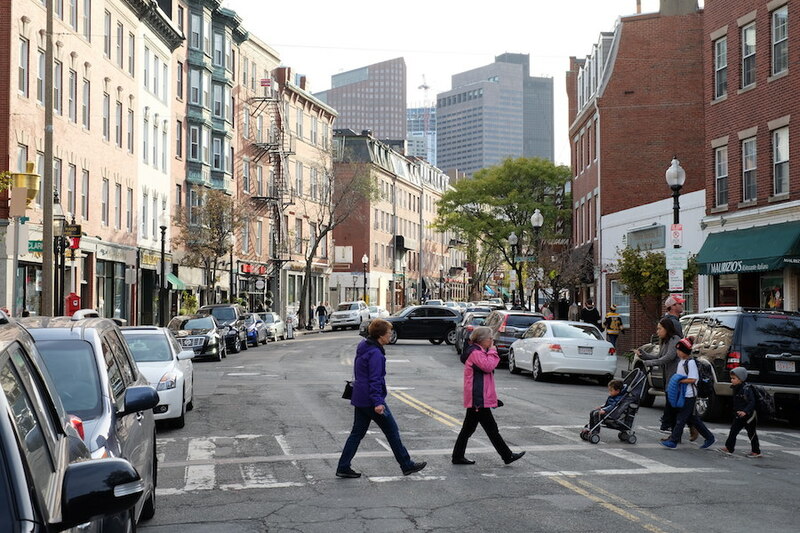 Different towns and districts served up some of the best food I had eaten and given my Italian ancestry, the North End was one of my favorite places to spend a day. The smells of the food being prepared for the evening dinners, the salumi hanging above the counters and in the windows, and Italians speaking the native language and laughing together in the streets made this place special. I love the North End. As a newcomer, I was told about the cannoli in the North End and it was suggested I go to Mike’s Pastry. I’ll never forget entering the shop where there was a wall of cannoli to choose from. There must have been 20 varieties. Sure, there’s the typical cannoli filled with ricotta cheese and the chocolate chip adorned cannoli, but Mike’s takes things to the cannoli extreme. How about Limoncello, Amaretto, hazelnut and of course pistachio. These are the flavors of Italy, so of course, there’s a cannoli for that! Mike’s doesn’t stop there. To appeal to a more American audience they have added Oreo, mint chip, chocolate dipped, and even pecan caramel. Sounds like Baskin-Robbins. There were hundreds of cannoli in the case, ready to be boxed and served. And then there are these! For years I had relied on Mike’s for my cannoli fix and after moving south, I often thought about Mike’s. 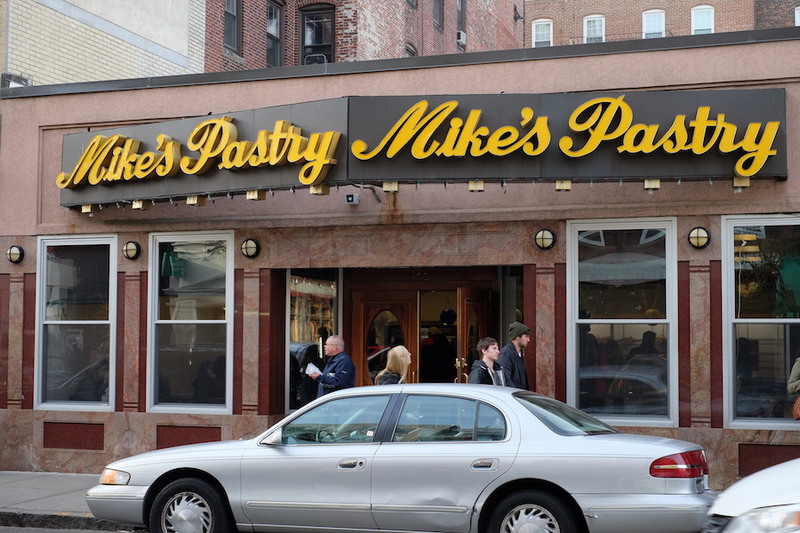 Recently, we traveled to Boston and I mentioned Mike’s to a friend. She and Gwen said you mean Modern. This led to quite the discussion about cannoli and my obvious lack of local knowledge. I guess as a newcomer I never questioned where to get a cannolo (yes, cannolo is singular of cannoli) in Boston, but after talking to several local friends, it became obvious that there is strong passion about cannoli and where to find the best. Maybe this is what the older gentlemen were talking about in their chairs. 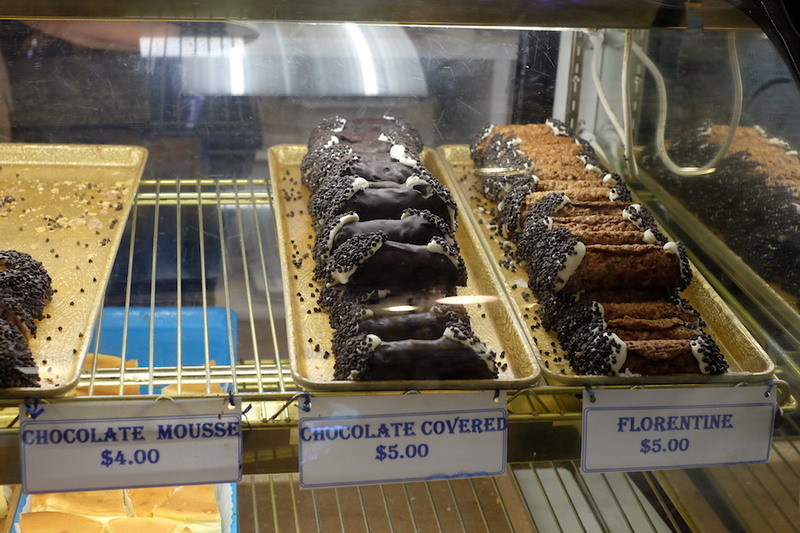 So, with new information, I set out on a mission to find the best tasting cannoli. First stop, Mike’s. Well, there are actually 18 flavors. We selected the plain and pistachio. The server, though very slow and very distracted chatting with the other servers, boxed up our cannoli and tied it in twine with a cute bow. We took our box containing two cannoli and headed across the street and 100 yards west to Modern Pastry. 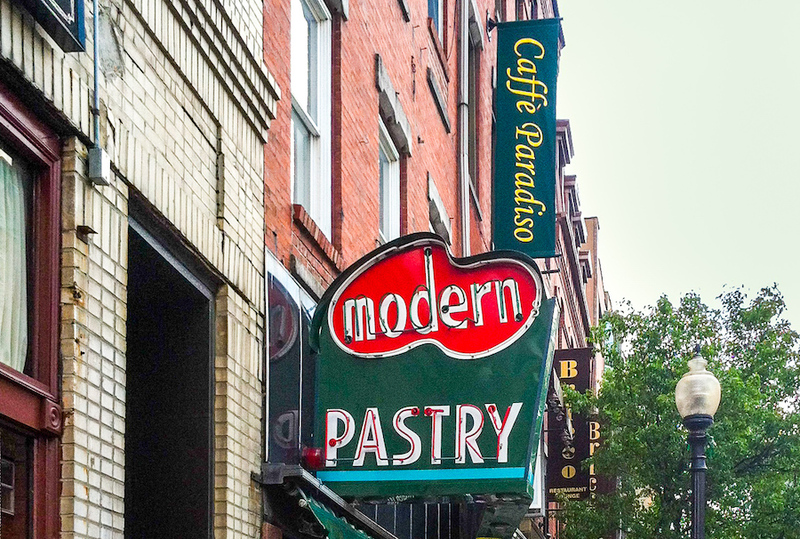 I had been to Modern Pastry before, but quite frankly, there has been quite a transformation in the old-style shop that used to sell freshly made cannoli and Italian cookies. It’s now a beautiful cafe and pastry shop and the cannoli almost seem to have taken a back seat since the other pastries are displayed in glass cases, while the cannoli (as always) are prepared when ordered. A family-owned store that has been in business for 70 years, Modern has won numerous awards. Our turn came and I asked for two cannoli. As I was talking, the server picked the lid off a glass jar on the counter, pulled out two empty and small cannoli shells and went to the back. He came back with two freshly stuffed cannoli, asked if we wanted powdered sugar, dusted them with the powdery white stuff when we said yes, and placed them in a small box, wrapped it with twine and sealed it with a twine bow. The twine bow must be a thing. We took our two boxes and headed to the nearest park bench to sample our cannoli. Drum roll, please. Mike’s was everything I remembered. The fried cannoli shell was hard and filled with lots of flavorful cream. The cannoli are so large I bet you can’t eat one… and I do mean one. They are very filling. On to Modern Pastry. 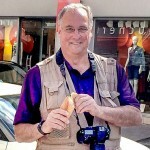 The dainty little cannoli were much smaller, maybe one-third the size of Mike’s, and the first bite told the story. The fried shell is much thinner, crisper, and more flavorful and the cream filling is smoother, fresher tasting, and so delicious. There were no extra flavors to hide the creamy ricotta flavor. It stood on its own and proudly declared itself the winner. Going back to take a bite of one of Mike’s cannoli, I realized the shell is just too hard and thick to really enjoy the cream. The cream in Mike’s had been in the shell, in that showcase, allowing it to dry out and was not smooth and rich. We spoke to several people on the street to get their impressions of Mike’s vs. Modern and the bottom line is, “Tourists like Mike’s, locals like Modern.” I can understand why. 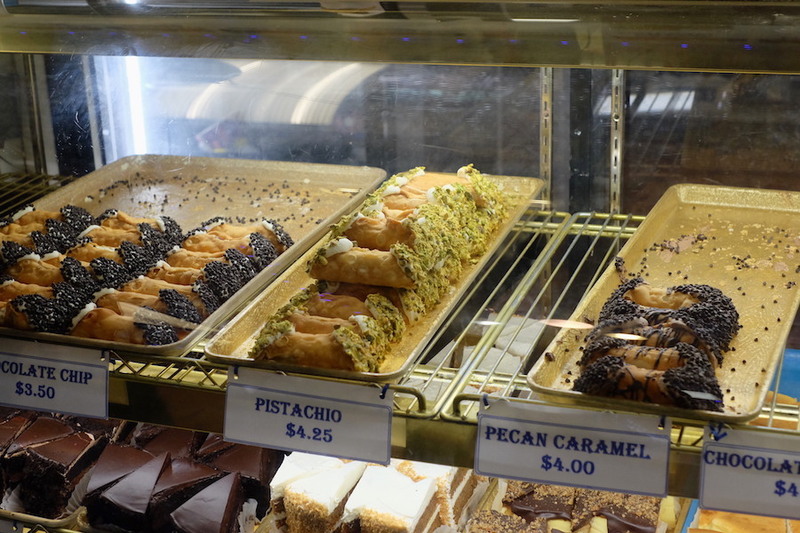 If you want the wide selection with lots of flavors and colors to choose from, then Mike’s is the place, but if you’re looking for an authentic Italian cannolo, Modern Pastry wins hands down.